Thursday evening I was out with business friends at Big Rig Brewery & Kitchen (2750 Iris Street, Ottawa) which is near the Ikea just off Pinecrest Road. I arrived at 7 P.M. to find the restaurant's parking lot full of cars and, inside, full of people. There were three tables reserved with two for our party and 1 for another. The rest of the bar and restaurant area quickly filled up as the 1st period of the Ottawa Senators vs New Jersey Devils NHL game started. Even with only 4 people at our table and none at the other two tables further down it was hard to hear a conversation. This is despite us sitting across the table and next to each other. Acoustics of this restaurant is terrible and could be rectified with some sound paneling that would absorb some of the sound. Adding the live play by play emanating from the televisions showing the hockey game only made things worse. Thus, until this issue is fixed, if you wish to have a conversation over beer and food you may want to skip the busy periods. I sat down with the menu already there. With reservations, Big Rig places menus at each spot so people arriving can grab their spot, peruse the menu and order with waitress who checks in often. Our waitress, Ashley, was awesome. She kept track of everyone's order separately and was willing to refill drinks or take food orders at any time. At check out my bill was exactly as I had ordered with no mistakes. This was despite the fact there were 12 of us at the restaurant that evening all with separate bills. Ashley took each order separately carefully writing it down and went around the table. She eventually got to me and I place my order. The Order: 1 Big Rig Classic Burger with Swiss Cheese and Sweet Potato Fries with a Big Rig Gold beer. The food came within 20 minutes of ordering on a consistent basis. Ashley dropped off my order. The only problem? Where's the ketchup? Sure I have a nice mayonnaisey dip for the fries, but how about a little old fashioned ketchup? Not sure why this was not brought to the table. I asked Ashley and she quickly brought a cup of ketchup, the same size as the mayonnaise, of ketchup to the table. I guess a squirt bottle isn't good enough for Big Rig and a more upscale ketchup was needed. The burger, after the ketchup was added, was delectable. A nicely cooked beef baddie with average lettuce, tomato, pickle and other toppings. 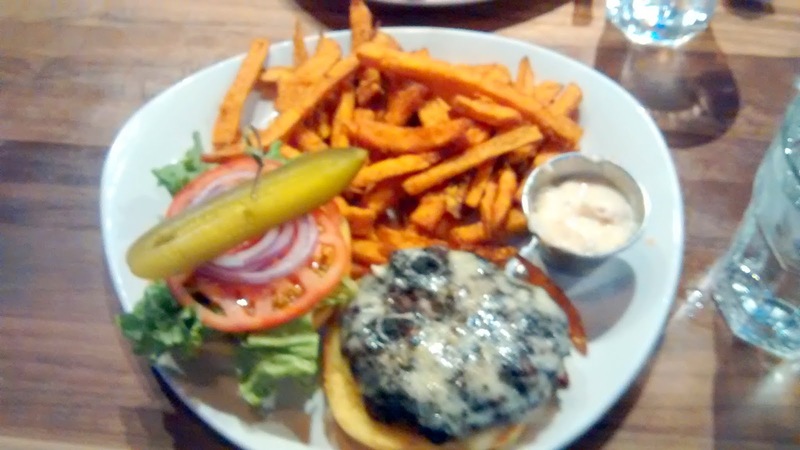 The sweet potato fries were nicely coloured on the outside yet soft and chewy on the inside. They could have been slightly warmer though, but with that much food preparation going on for a party of 12, some food temperature issues are to be expected. The Big Rig Gold beer was a smooth golden looking beer similar in colour to a Molson Canadian gold. Nice smooth taste going down with no aftertaste. A good smooth drinking beer. Overall, Big Rig has a great concept of a locally owned brew pub. Service is good but the prices are slightly higher than normal pubs. A $14 and change for a burger and fries without an upgrade? Seems a little high to me. Add to this it is hard to hear the person next to you speak and it only makes things worse. But I will score them on excellent service and well prepared food and drink. Hopefully the pricing and sound issue will be rectified soon. An excellent addition to the Ottawa dining scene with a few issues still to be ironed out.